← The benefits of wearing a cycle helmet! After Sunday’s spill I thought it good to get back on my bike ASAP. So donning my old commuting helmet I headed for the seafront. My bruised condition really helped me practice what my “coach” had been telling me about low intensity training, and I was further helped by a nice warm wind assist going from Brighton to Worthing. When I got to Grand Avenue, West Worthing I decided to turn round and head back into the wind. 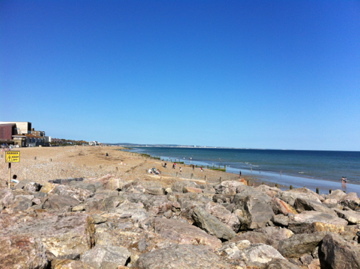 The weather was just sublime and I stopped for an ice cream (99) at Splash Point – oh what luxury. In the end I clocked up 27 miles at an average of 9.9 mph (cycling time) – this was 1mph slower than when I last cycled the seafront, but I managed with an average heart rate of 8 bpm less than my low intensity target and I am sure some 20 bpm lower than previous – so today I was being lazy but I feel that low intensity training makes sense. My running total mileage since getting back on my bike after an awful late winter/spring is 340 miles in 7 weeks – I am sure I feel better than I did back in May – Onwards and upwards. This entry was posted in Keeping Fit, Low intensity training, MTB. Bookmark the permalink.